Regulatory Implications and Recommendations for Distance Education in Prelicensure Nursing Programs." Description: This article provides the background and related literature findings for the recommendations that NCSBN's Distance Learning Education Committee made for prelicensure nursing programs. These recommendations were adopted at NCSBN's 2014 annual meeting. Further, regulator and educator issues are explored. Five regulatory guidelines are explained, and a timeline for BONs meeting these recommendations is described. Citation: Lower, B. & Spector, N. (2014). 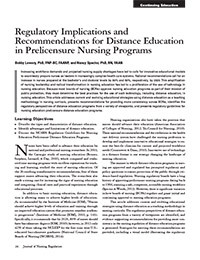 Regulatory implications and recommendations for distance education in prelicensure nursing programs. Journal of Nursing Regulation, 5(3), 24-33.